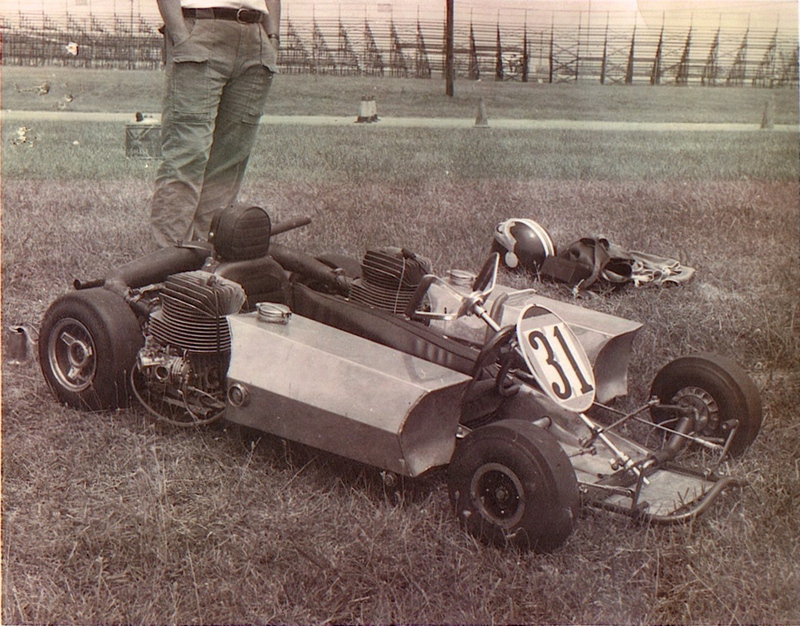 Here is a picture of my B-Open from 1970 at Indy Raceway Park. Note the rotary valve Komets with duel carbs running on alcohol and on those skinning hard Goodyear tires. It also had “Darryl Domes” designed expansion pipes. Darryl, from California was the “Man” back then in B Open, so I had to have his pipes! I was 20 years old then and 37 years later I am still road racing laydowns, but with one engine in lieu of two. Editors Note: Here is an additional picture Jim sent me of his Hornet/Parilla from 1966. Love the cowboy hats and the white pants! This is from Bill Pyles, a guy who today races 125 sit up shifters – and is quite good at it! By the way, I wanted to tell you that I took and developed the black and white photo of Jim Fry’s B-Open Hornet with twin Komets that appears on the Lost Enduros web site. 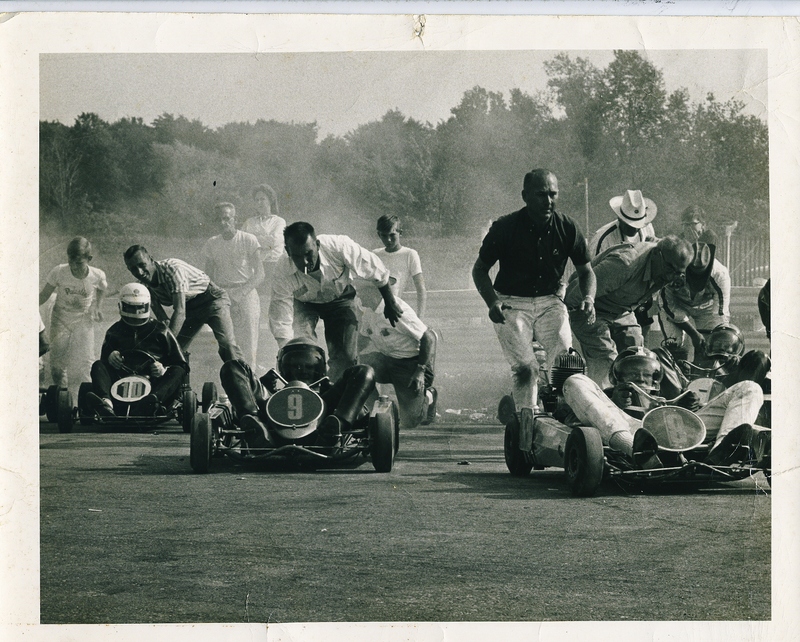 I was 13 years old at the time, and my dad (whose legs appear in the photo) and I visited IRP during the enduro nationals in July 1970 where the photo was taken. I have the original photo on my desk. Notice the imperfections in the upper left corner of the image? Those are teeth marks from my cat who apparently liked the smell of the photographic chemicals. 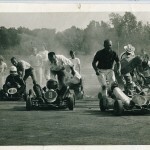 Several years ago I was looking at the photo and I think I saw a post on ekartingnews from Jim Fry, (who was no where near the kart when I photographed it and whom I did not know) and I contacted him to ask him if he was the same Jim Fry who raced enduros in the 70s. He told me he was, and I explained that I had a photo of his kart. Jim asked if I could send it to him to view (I don’t honestly remember why I did not just scan it) so I sent it to Jim at his address in Atlanta, and he later returned it to me. I subsequently met Jim at Road America several years ago and I believe he was at Road Atlanta in Nov 2007 where I also raced. Anyway, it is a very small world we karters live in, as you know, and I thought you might like to hear the story of that particular photo.